Our Heroes winner Corey Stephens-Goodall with Jonathan Wilkes and Rachel Shenton. Created in conjunction with Britannia, the gala celebrity awards dinner for this community awards campaign is the highlight of the North Staffordshire social calendar. During its first six years, our sponsor Britannia gave away £60,000 in prize money. To date The Sentinel has published more than 900 heart-warming human interest stories involving children of courage, charity fund-raisers, school stars, heroes of the NHS, adult carers, community groups and emergency services and armed forces personnel. I am delighted to say the 2012/13 and 14 events are being sponsored by the Newcastle-based Aspire Housing group. Yours truly manages the event and is the co-host. 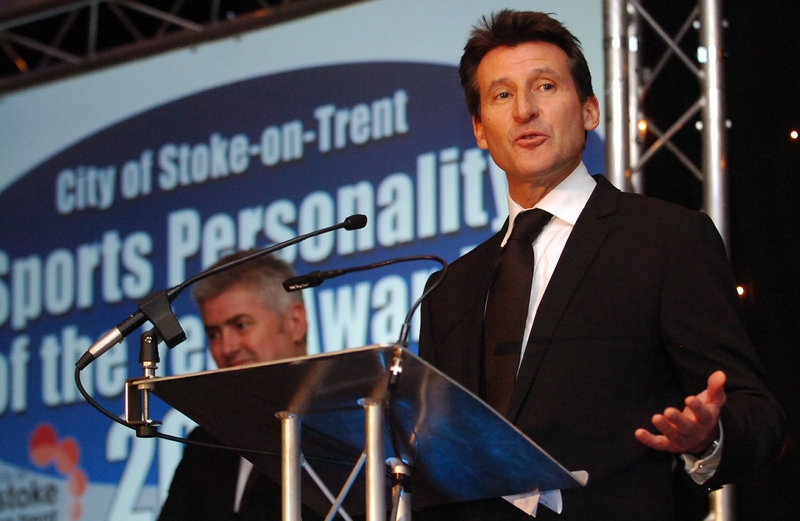 Lord Sebastian Coe, our guest of honour at the Sports Awards, gives the keynote speech. In the background is compere – Potteries TV star Nick Hancock. Now in its 39th year, I became involved in this annual event six years ago. Run in conjunction with Stoke-on-Trent City Council it aims to promote endeavour and talent in grass roots and amateur sport as well as recognising the achievements of the city’s professional sporting stars. 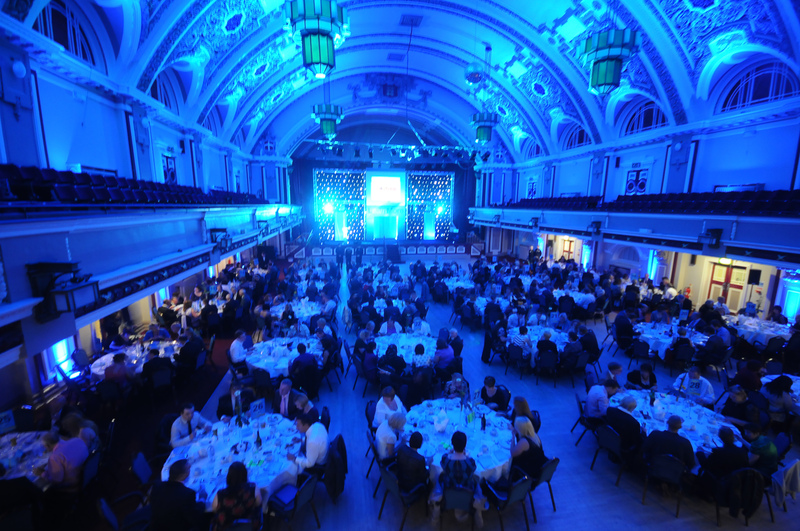 The 2014 gala celebration evening took place at the King’s Hall in Stoke and was hosted by Colin Jackson OBE. Previous VIP guests have included James Cracknell OBE, Dave Moorcroft OBE, Jonathan Edwards CBE, Sally Gunnell OBE DL, and Lord Sebastian Coe. Yours truly organises the event. Yours truly interviewing one of the pupils from a winning school in the 2012 Class Act competition. Run in conjunction with Barclays, Class Act is now in its sixth year. To date Barclays has given away £60,000 in prize money to local schools and colleges which have come up with innovative ideas to enhance the learning environment or their local community. More than 200 schools and colleges from North Staffordshire and South Cheshire have so far featured in The Sentinel as part of the Class Act competition. Yours truly comperes this event. 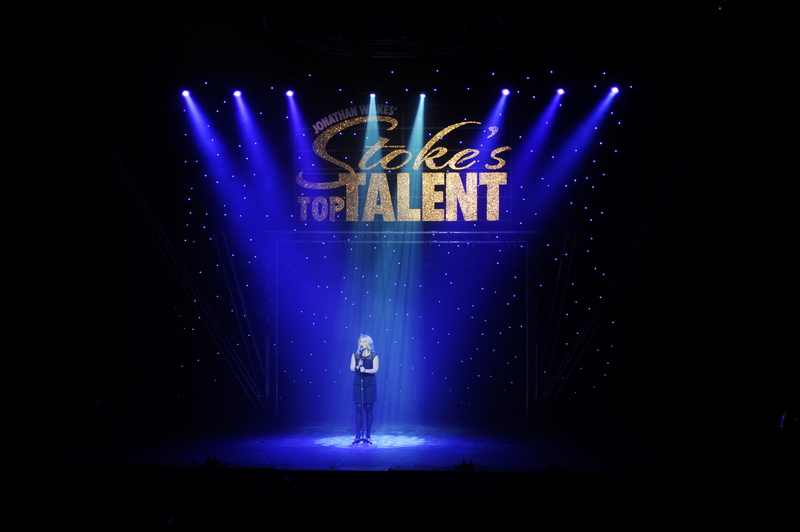 West End star Louise Dearman performs at the Stoke’s Top Talent Final. Run in conjunction with The Regent Theatre and championed by stage star (and my mate) Jonathan Wilkes, this annual variety competition offers all ages the chance to appear on stage at the city’s premier theatre and win £2,000 in prize money and a professional contract to appear in pantomime alongside our Jonny. To give you an idea just how popular Stoke’s Top Talent is, the reader vote on The Sentinel’s website generated 25,000 votes in 2010. Yours truly is a judge for the auditions, heats and final of this event. 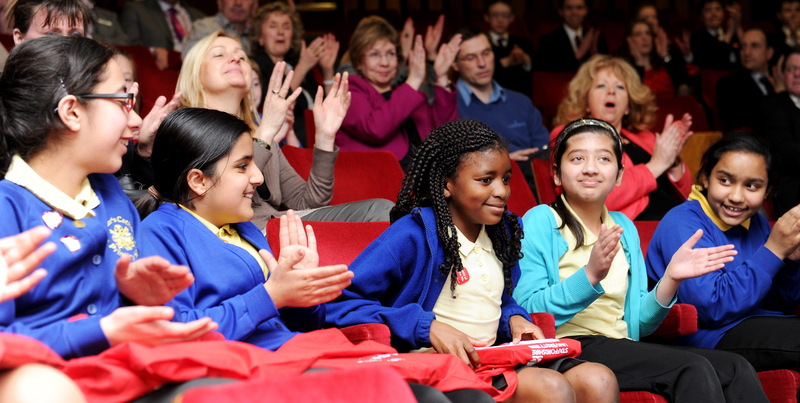 Youngsters celebrate as one of their classmates wins a Young Journalist Award. Now in its fourth year, the Young Journalist Awards is run in conjunction with Staffordshire University and offers the reporters and photographers of the future – from local schools and colleges – the chance to see their work appear in print and online. Yours truly comperes the awards ceremony. The King’s Hall in Stoke all decked out for the LearnMore Awards ceremony. Working with PR agency PlinkFizz, I write the scripts for and compere this annual awards ceremony which has been running for two years and is funded by Stoke-on-Trent City Council. It aims to highlight achievement through education. The Citizen of the Century gala awards dinner at the King’s Hall in Stoke. 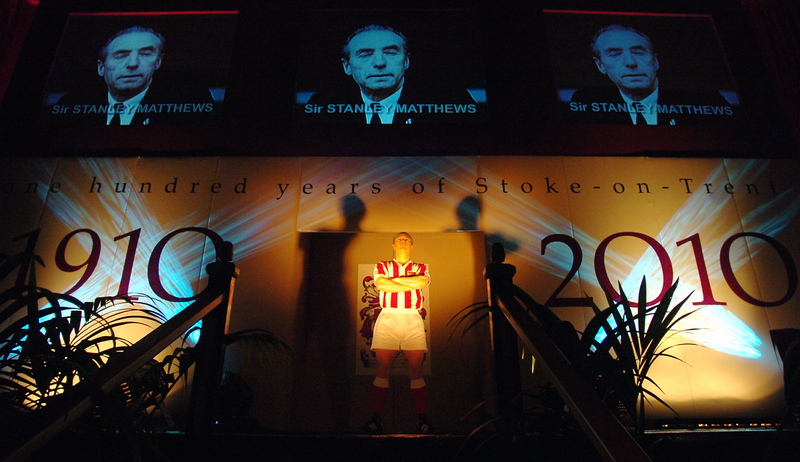 Organised to celebrate the centenary of the Federation of the Six Towns of Stoke-on-Trent, this glittering awards ceremony was held at the King’s Hall in Stoke and recognised the achievements of some of the Potteries most famous sons and daughters – from football legend Sir Stanley Matthews to Spitfire designer Reginald Mitchell and pop superstar Robbie Williams. Yours truly wrote the scripts and compered the show in front of 450 guests. Mike Wolfe at the inaugural Sentinel Lecture. 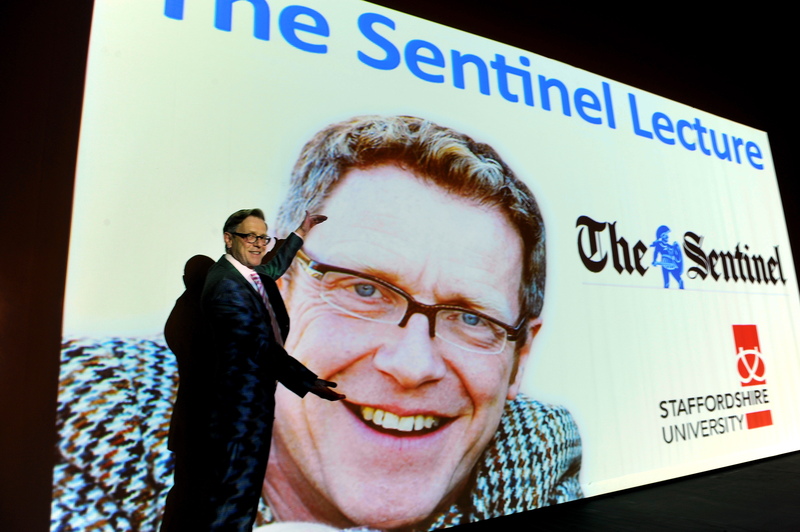 The inaugural Sentinel Lecture was held in 2011 at the newly-refurbished Mitchell Memorial Youth Arts Centre in Hanley and attracted almost 300 guests. Sentinel columnist and former elected Mayor of Stoke-on-Trent Mike Wolfe spoke on the subject of regeneration. 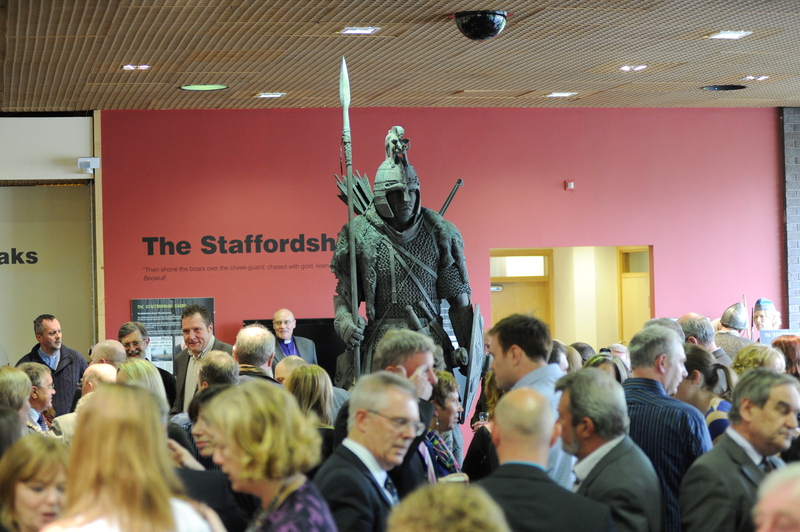 The launch event for the Staffordshire Saxon at the Potteries Museum and Art Gallery. With colleagues at The Sentinel I helped to nurture the idea of the Staffordshire Saxon – a piece of artwork to celebrate the acquisition of the world-famous Staffordshire Hoard by the Potteries Museum and Art Gallery. My initial article in the newspaper led to a collaboration with internationally-renowned artist (and Stokie) Andy Edwards who produced an awe-inspiring piece of public art – the nine foot Staffordshire Saxon warrior sculpture which now takes pride of place in the museum’s foyer. Yours truly organised and compered the launch event. 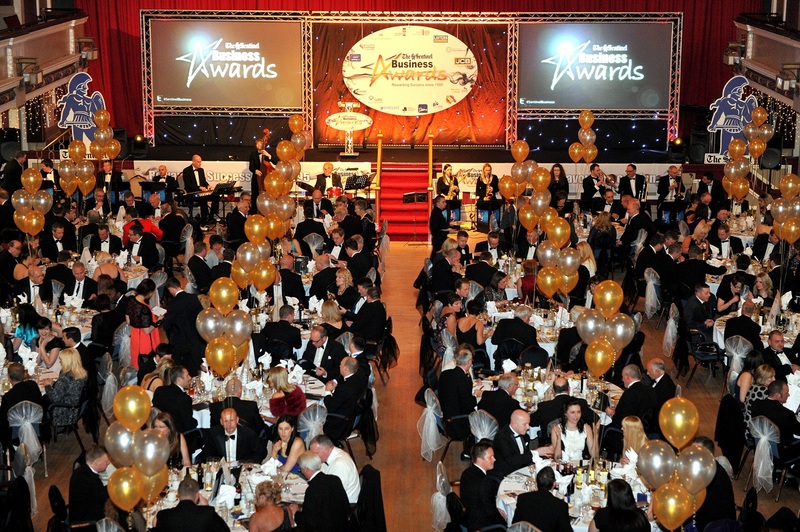 The Sentinel Business Awards 2014. On March 26, 2013, my team masterminded The Sentinel’s Business Awards for the first time. More than 420 people, including a veritable who’s who of the Staffordshire business community, now enjoy the annual event which is hosted by BBC newsreader Janine Machin. This year’s competition, overseen by our events team, attracted almost 130 entries – double the number in previous years. The 2014 event took place at the King’s Hall in Stoke on March 25.